Burdock is a common weed in temperate regions around the world, and is familiar to most outdoor enthusiasts because its seeds or “burrs” get stuck to clothes. The root is used in herbal medicine, and is also consumed as food (called Gobo) in Japanese cuisine. Burdock is an important alterative or “blood cleanser,” used to treat chronic skin conditions like acne. It is believed to act as a detoxifier by promoting sweating, urination, and bile release from the liver. Its bitter compounds (sesquiterpene lactones) promote digestion and elimination of waste products and it has been used for bloating and indigestion. It also contains compounds called lignins (similar to what are found in flax seeds) and these compounds have phytoestrogenic effects. 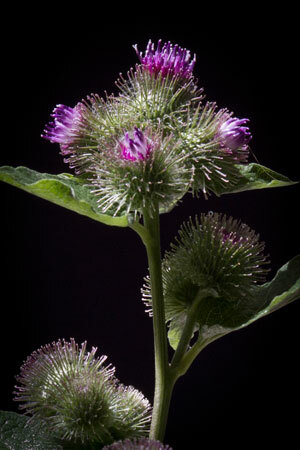 Burdock is one of four herbs in the traditional anticancer herbal formula “Essiac”. Although no clinical trials have been performed to date measuring the efficacy of the formula against cancer, some preclinical trials suggest that burdock does possess some anticancer properties.